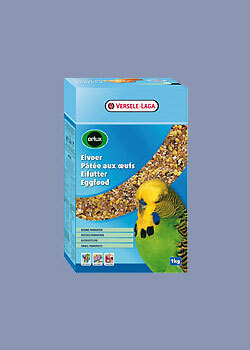 Orlux Gold patee small parakeets is a ready-for-use eggfood for budgies and likewise for neophemas and lovebirds. It is also a well-accepted titbit for pet birds. 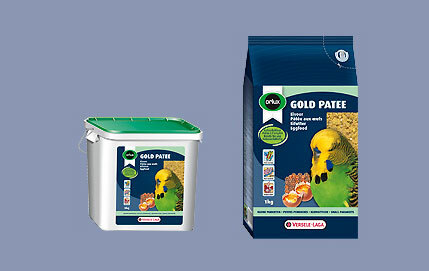 Gold patee small parakeets has a high nutritional value by adding 100 % pure and natural honey. The extra added lysine and methionine guarantee an optimal growth and feather composition. The extra iodine stimulates the activity of the thyroid gland. This food has a coarse structure for better assimilation. 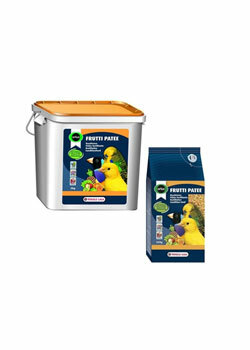 Orlux Frutti patee is a multi-colour condition food to bring extra energy to your canaries, tropical finches and small parakeets. It is also a well-accepted titbit for pet birds. Frutti patee is enriched with dried fruit. This condition food has a high nutritional value by adding 100 % pure and natural honey. The extra added lysine and methionine guarantee an optimal growth and feather composition. Cuttle bone is a natural source of calcium and minerals. 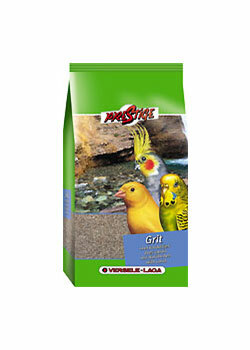 Prestige Grit with coral is a mixture of oyster shells, grinding stones, seashells, redstone and charcoal: an essential food supplement for every bird. It is not only a rich source of minerals and trace elements. The grinding stones are absolutely crucial for a proper digestion. 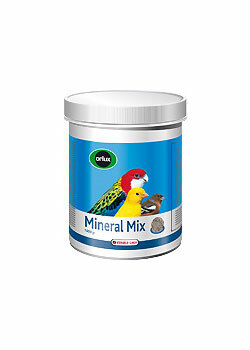 Gritstone Orlux Mineral Bloc Mini is a balanced combination of different types of grit, sea corals and stomach grit; specially suitable for canaries, budgies, European and tropical finches. 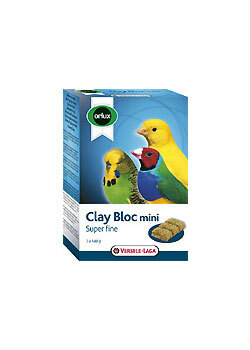 Orlux Clay Bloc Mini super fine is a pickstone for canaries, budgies, European and tropical finches, on clay basis. It is a source of minerals and trace elements. Pickstone Orlux Pick Bloc is a balanced combination of different types of grit, sea corals, stomach grit and redstone. 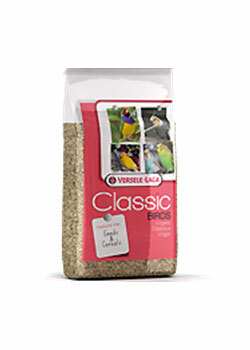 Specially suitable for canaries, tropical and European finches, budgies and large parakeets, exotic pigeons and fancy fowl. Orlux Mineral Mix is a balanced combination of lime, phosphorus, fine oyster grit, stomach grit and seaweed. Specially suitable for canaries, tropical and European finches, budgies, large parakeets and parrots, exotic pigeons and fancy fowl. 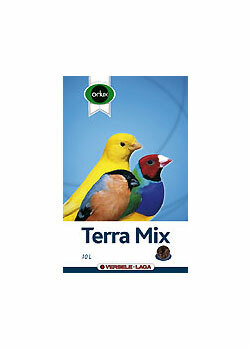 Orlux Terra Mix, a scratching peat from pure soils, only contains natural raw materials, black peat and trace elements. Specially suitable for canaries, tropical and European finches, budgies, large parakeets, parrots, nectar-eating birds, exotic pigeons and fancy fowl. 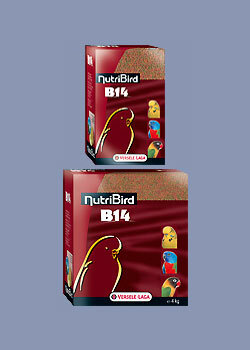 NutriBird B 14 is a balanced complete maintenance food for budgies and other small parakeets. Also well suited for lovebirds, neophemas and parrotlets. Pellets with a scientifically approved composition, based on selected grains, fresh fruit and 50 % millet. Completely consumable, no losses. Contains Florastimul, which supports the intestinal flora and protects against intestinal disorders. If your bird is not used to pellet food, the switch to this new type of food must be made gradually. 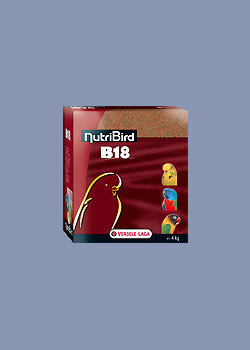 NutriBird B 18 is a balanced complete breeding food for budgies and other small parakeets. Also well suited for lovebirds, neophemas and parrotlets. Pellets with a scientifically approved composition, based on selected grains, fresh fruit and 50 % millet. Completely consumable, no losses. Contains Florastimul, which supports the intestinal flora and protects against intestinal disorders. If your bird is not used to pellet food, the switch to this new type of food must be made gradually. This premium seed mixture has a varied and balanced composition, specially attuned to the specific nutritional requirements of budgies. With VAM- and fruit pellets full of extra Vitamins, Amino acids, Minerals and Florastimul® for optimal condition and digestion, chia seeds for extra provision of omega-3 fatty acids and oyster shell for the correct functioning of the gizzard and the right calcium/phosphorus balance. 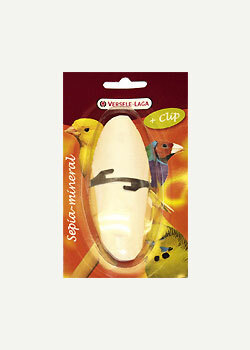 Versele-Laga supports the Loro Parque Fundación in its aim to preserve endangered bird species and their environment. By buying this product you are supporting the Loro Parque Fundación to help nature. Depending on the type and age of the bird the daily ration of seeds may differ greatly. For that reason give a generous portion in the beginning and you can then define the ideal daily ration after a while. Refresh the food and drinking water daily. Multicoloured mixture for budgies and other small parakeets. 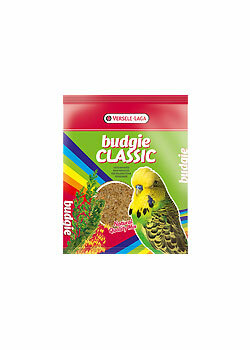 Prestige Budgies Classic is a traditional mix for small parakeets, at a very good price. 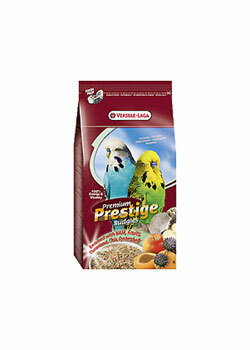 Prestige Aviary Classic is a traditional basic mix for aviaries with mixed population: canaries, parakeets, tropical and European finches. 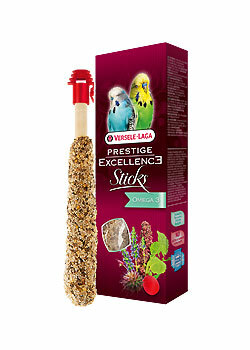 Prestige Excellence Sticks Budgies Omega 3 are top quality oven-baked sticks with Omega 3 for budgies. These generously put together seed sticks with chia, radish seed and quinoa are a tempting snack for your birds. A banquet on a stick that will give them a lot of pleasure. Boredom does not stand a chance. Thanks to the "Magifix" variable hanging clip you can easily hang up the sticks in the animal pen, wherever you want. Furthermore, they are wrapped in "Freshpack" packaging, so the aroma and the crispiness are conserved until you open the bag. Finally, these sticks do not contain any artificial colourants or flavourings. The fragrances and colours of these delicious seed sticks are therefore 100 % natural. Buy them quickly! By the way. 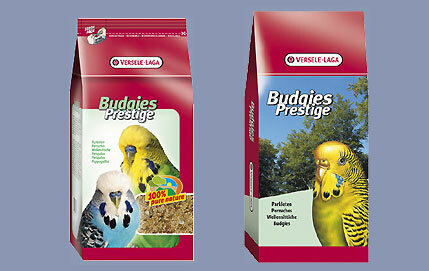 There is also another variety for budgerigars: the Excellence Sticks Budgies Nature Seeds. Feel free to alternate. 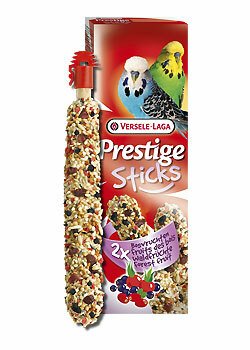 Prestige Excellence Sticks Budgies Nature Seeds are top quality oven-baked sticks with wild seeds for budgies. These generously put together seed sticks with over 15 kinds of wild seeds are a tempting snack for your birds. A banquet on a stick that will give them a lot of pleasure. Boredom does not stand a chance. Thanks to the "Magifix" variable hanging clip you can easily hang up the sticks in the animal pen, wherever you want. Furthermore, they are wrapped in "Freshpack" packaging, so the aroma and the crispiness are conserved until you open the bag. Mmmmm. By the way. 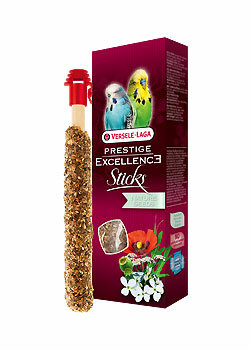 There is also another variety for budgies: the Excellence Sticks Budgies Omega 3. Feel free to alternate. Two oven-baked seed sticks for budgies, with a.o. honey. Thanks to this honey feast on a stick your birds will be able to enjoy a culinary delight. Boredom does not stand a chance. Two oven-baked seed sticks for budgies, with a.o. pineapple, banana, orange and mango. Thanks to this exotic feast on a stick your birds will be able to enjoy a culinary delight. Boredom does not stand a chance. Two oven-baked seed sticks for budgies, with a.o. elderberry, cranberry and rose hip. Thanks to this berry feast on a stick your birds will be able to enjoy a culinary delight. Boredom does not stand a chance. Complementary food for birds. 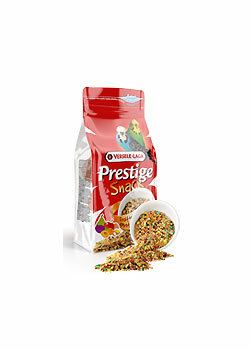 Prestige Snack Budgies is a snack mixture with fruit and egg for budgerigars. This snack mix promotes singing and is full of tasty seeds, supplemented with vitamins, amino acids and minerals for optimum condition. Budgies just love it. 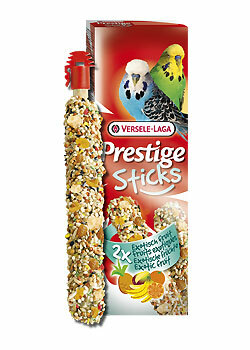 Also try the Prestige Snack Wild seeds, a mixture of over 30 herb, grass and vegetable seeds, suitable for all small birds. 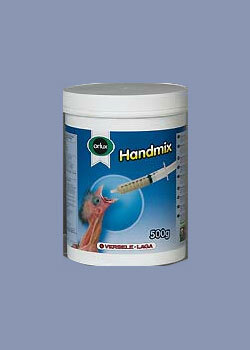 Orlux Handmix is an ideal hand-rearing food for all kinds of young birds. Handmix is extremely suitable for supplementary feeding of small birds in the nest and for handrearing exhibition birds and psittacines. 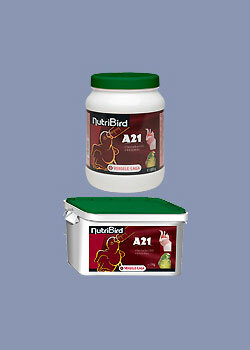 NutriBird A 21 is a complete birdfood for hand-rearing of all baby-birds. Scientifically composed for an optimal growth. Oropharma No-Pick is a Bitterspray against feather pecking. This product protects growing youngsters from feather plucking by parent animals and helps to prevent feather pecking and self mutilation. Feather pecking of your birds may have many causes. But we can make a clear distinction between feather plucking of growing youngsters by parent animals and pecking their own feathers, primarily by adult psittacidae birds. No-Pick is very effective against the plucking of youngsters by parent birds. 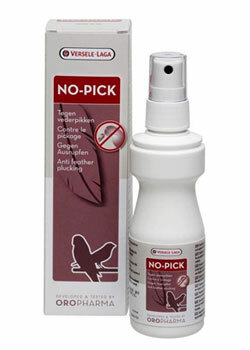 This easy to use spray has an extremely bitter taste that removes the parent animal's urge to pluck the feathers. Many causes are possible with chronic feather pecking. It may be a result of stress, frustration, a dietary deficiency or a combination of various factors. Consult a vet to find out the true cause in your bird because breaking the automatic reflex of feather pecking requires a total approach! In addition to providing more activities for your bird, adapting its accommodation to size, adjusting its diet and regularly bathing your bird, No-Pick is an ideal support due to its extremely bitter taste, which discourages your bird from pecking its feathers. At chronic feather pecking: spray once a day on the birds. ATTENTION! don't spray in the eyes or the beak. Complementary feed for birds. Oropharma Avi-Chol is a dietary supplement for birds for an optimal liver function and a good moult. It is a unique liver tonic based on sulphuric amino acids, biotin, sorbitol and vitamin B12. Avi-Chol ensures optimal growth, perfect plumage development and pigmentation in young birds as well as perfect plumage development and pigmentation in moulting birds. This product also promotes the elimination of waste products from colour pigments and medicines. Optimal liver function is crucial to your bird's health. In young birds, where the body is still in full development, the liver is subject to extra strain due to the greater need for energy, proteins, vitamins, fats and hormones. During the moult the plumage is changed completely. All the necessary elements must be available in the right proportions and supplied adequately. Any deficiency will be visible in the poor quality of the feathers. 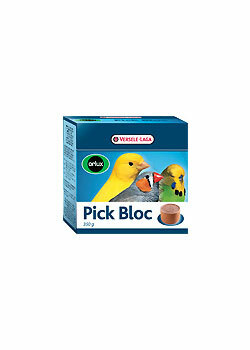 Your bird's liver is subject to additional strain when colour pigments (coloured canaries) are administered. Administering medicines also puts strain on your bird's liver. Hence the importance of administering a supplement that supports the liver. 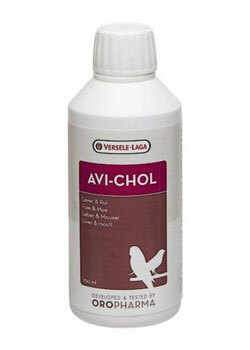 Avi-Chol contains the active components (methionine, choline, biotin, vitamin B12 and sorbitol) required for optimal liver function resulting in a perfect, glossy plumage and pigmentation. 2 bottle tops (10 ml) per litre of drinking water or per 500 g of Orlux eggfood. On administration of colour pigments for plumage e.g. Can-Tax or Yel-Lux: two to three times a week. Complementary feed for birds. 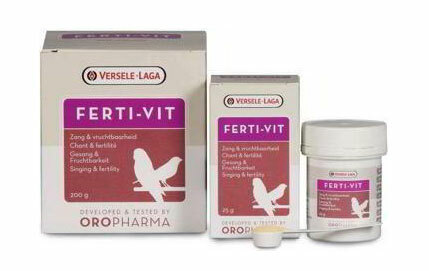 Oropharma Ferti-Vit is a well-balanced blend of vitamins, amino acids and trace elements, enriched with vitamin E. To be used during preparation for the breeding season, for the song of canaries and finches and in cases of laying and fertility disorders or in cases of death in the egg. Ferti-Vit promotes sexual drive and fertility. During the breeding season a bird needs an optimal blend of vitamins, amino acids and trace elements. The essential vitamin E, also called the fertility vitamin, is a strong antioxidant. The combination of the components in Ferti-Vit is not only optimal for breeding, but also increases the resistance to disease and helps protect the heart and muscular tissue. 1 level measure (= 1 g) of Ferti-Vit per 250 ml drinking water or per 100 g Orlux soft food or eggfood. During the preparation for the breeding season (3 to 4 weeks) until the first egg has been laid: give daily. 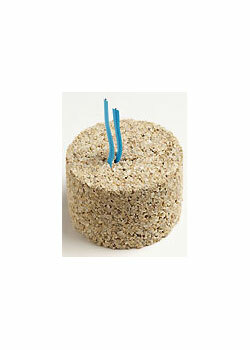 During the competition season for finches and other competition birds: give three times a week. See also the Oropharma instructions table for the optimal combinations of Oropharma products, adapted to every season. Complementary feed for birds. Oropharma Omni-Vit is a balanced blend of vitamins, amino acids and trace elements. This dietary supplement is administrated for optimal condition, better breeding results, optimal development of the chicks and in conditions of weakness or stress. Omni-Vit helps in cases of decreased resistance due to infection. Vitamins, amino acids and trace elements are dietary components that are essential for a good metabolism. With heavy exertion, illness or during growth the supply of these essential components via the food may be insufficient and then this product is recommended. Omni-Vit contains only vitamins, amino acids and trace elements with a high biological availability, which ensure an optimal development of proteins in the body, essential for good breeding and condition. 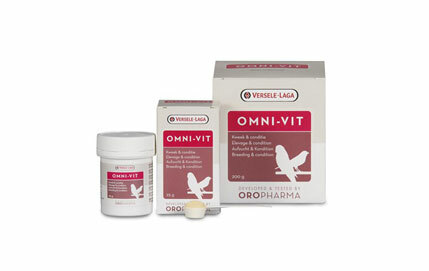 1 level measure (= 1 g) of Omni-Vit per 250 ml drinking water or per 100 g Orlux soft food or eggfood. Throughout the entire year to maintain an optimal condition: once a week. During the breeding period: twice a week. When recovering after illness: for 5 consecutive days. After vaccination: for 3 consecutive days. Complementary feed for birds. Oropharma Muta-Vit is a special blend of vitamins, amino acids and trace elements, with high content of sulphurous amino acids and biotin. This dietary supplement promotes feather development and condition, strengthens the plumage, protects the liver and ensures an optimal metabolism. Muta-Vit helps to prevent fright moulting. During the moult, the bird is subject to stress. An optimal supplement to the feed is necessary then. The sulphurous amino acids in Muta-Vit are essential for the production of keratin, the building material for feathers and skin. Biotin ensures good quality keratin. This guarantees a fast and good moult. 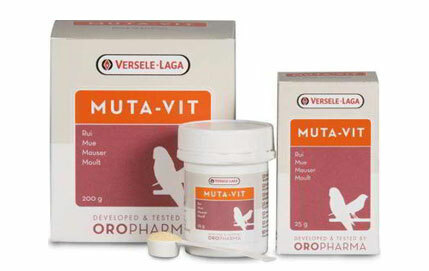 1 level measure (= 1 g) of Muta-Vit per 250 ml drinking water or per 100 g Orlux soft food or eggfood. During the moult to promote the development of the feathers: three times a week. During the preparation for the show season: for 4 consecutive days. After treatment with antibiotics or other medicines: for 5 consecutive days. In cases of decreased appetite as a result of a poor metabolism: for one whole week. Complementary feed for birds. 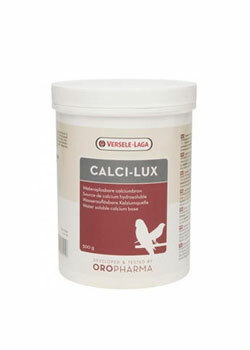 Oropharma Calci-Lux is a high quality, water soluble source of calcium. This dietary supplement is administrated for good egg shell formation, for good skeletal development in young birds, during the breeding season to prevent egg-binding and in cases of calcium deficiency or calcium tetany. Calcium is an essential element in the bird's body. Amongst others it is essential for the correct functioning of the nervous system. Calcium deficiencies in birds regularly result in serious health problems. If the bird is not given enough calcium, it causes decalcification of the skeleton and bone deformation. In the hen a calcium deficiency during the breeding period results in poor egg shell formation and even to egg-binding. Giving extra calcium to birds during the breeding and growth season is therefore strongly recommended. Sufficient calcium ensures good egg shell formation and the development of a healthy skeleton. 1 level measure (= 4 g) twice a week per 100 g Orlux eggfood or per 250 ml drinking water. 2 level measures (= 8 g) daily per 100 g Orlux eggfood or per 250 ml drinking water. 3 level measures (= 12 g) daily per 100 g Orlux eggfood or per 250 ml drinking water. Complementary feed for birds. 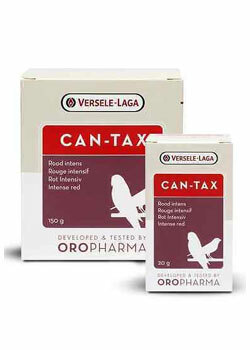 Oropharma Can-Tax is a red colourant based on canthaxanthin. This dietary supplement colours red canaries, intensifies the red colour in other birds and ensures a beautiful even red colour. As feathers consist of dead cells and are consequently not fed by the metabolism, they absorb the colour when they are formed. On average, the plumage is changed once a year. However not in one go. The moulting of the old feathers is stimulated by the formation of new ones and this is a gradual process so that the bird keeps a full plumage. When adding Can-Tax to the food canthaxanthin is transported to the place where the feather is growing and it is given the more intense red colour. Beta-apo-8’-carotenal ensures even better absorption of canthaxanthin. The feather formed retains its colour until the formation of a new feather. Packs of 20 g and 150 g: 1 level measure (= 1 g) per 100 g Orlux eggfood or per 200 ml of drinking water. Pot of 500 g: 1 level measure (= 5 g) per 500 g Orlux eggfood or per 1 litre of drinking water. During the breeding season: 2 weeks before laying the first egg. During the moulting: daily for the entire period. Doubling the dose is recommended during the moult. Show birds: daily, all year round. Complementary feed for birds. 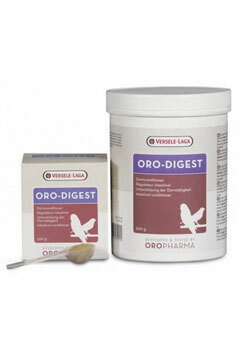 Oropharma Oro-Digest is an intestinal conditioner. This product prevents the adhesion of pathogenic bacteria in the intestines, ensures a better consistency of the droppings, promotes hygienic nests and prevents the cloaca feathers from sticking together. There are bacteria in the bird's digestive tract which are essential for a good digestion. Good bacteria predominate in a healthy bird. However if pathogenic bacteria predominate, the bird will have watery droppings resulting in a loss of large amounts of fluids and electrolytes. Administering antibiotics kills both good and pathogenic bacteria. Oro-Digest serves as a probiotic or food for the good intestinal flora and will also ensure that the pathogenic bacteria are no longer able to adhere to the intestinal wall so that the natural intestinal flora can recover and the digestion proceeds normally again. 1 level measure (= 4 g) of Oro-Digest per 100 g of Orlux eggfood. In all cases of watery droppings or diarrhoea: administer for 5 consecutive days. From the hatching of the chicks until they can eat independently. At all times when the birds are exposed to unusual stressful situations. For 4 days before basketing for a show. Complementary feed for birds. Oropharma Probi-Zyme is a combination of probiotics and digestive enzymes. This dietary supplement promotes the crop and intestinal flora, increases good intestinal flora, ensures a better digestion of the food and gets the intestinal and crop flora of one day old chicks started. Probi-Zyme contains probiotics. These are good bacteria present in the bird's intestines (and crop). In addition to the good bacteria, Probi-Zyme contains special enzymes that promote the digestion of the food eaten. The combination of both, if administered at high doses, guarantees optimal functioning of the digestive system. Probi-Zyme is one of the few products in which the concentration of good bacteria is guaranteed. 1 level measure (= 1 g) per 100 g of Orlux eggfood or per 100 g of NutriBird hand-rearing food. 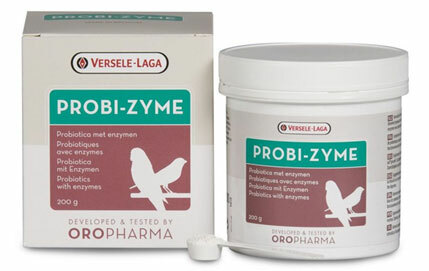 Add Probi-Zyme to the food just before feeding (this is to prevent the food becoming sticky). Probi-Zyme should always be given together with Oropharma Oro-Digest. The fructo-oligosaccharides present in Oro-Digest act as food for the probiotics in Probi-Zyme. Oropharma Oro-Bath is a special bath salts care product for glossy plumage. It makes feathers more supple, keeps the feet and skin free from scaling and ensures glossy feathers. Oro-Bath has a relaxing function on the muscles and cleans the skin and feathers. Everyone knows that birds like to bathe and also need it. Regular bathing is essential for maintaining the feathers. Adding Oro-Bath to the bath water gives the birds supple feathers and helps them to maintain the strength and water-resistant function of the plumage. 1 level measure (= 2 g) of Oro-Bath per 250 ml of bath water. The solution can be given as a free bath or sprayed over the birds using a plant spray. During the winter season: once a week. During the show season: once a day before basketing, once on the day it returns home from a show and during the interim periods every 2 to 3 days. During the other periods: twice a week. If Oro-Bath is added to the bath water, it must be removed a few hours later. For the detailed list of all components, see the information leaflet in the packing. A or twice (eg sign) treatment per week until the parasites are gone. 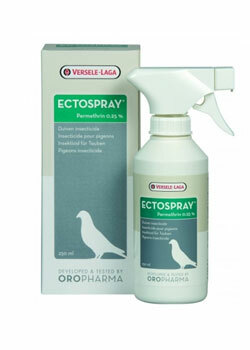 At the loft can Ectospray be used on walls, doors, perches, bowls and nest boxes. The transport baskets should be treated. Preventive - Treat every 4 weeks. 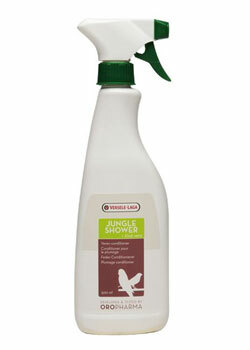 Oropharma Jungle Shower is a spray with aloe vera for glossy plumage and a healthy skin. This care product cleans the feathers, restores the balance of moisture of the skin and feathers, limits the loss of feather dust and helps to keep the skin healthy. The aloe vera plant contains over 200 different active substances, including mono- and polysaccharides, enzymes, minerals, vitamins, amino acids and numerous bioactive substances extremely important for keeping the bird's skin and plumage vital and healthy. Aloe vera is also known for its highly hydrating characteristics which restores the natural balance of moisture in the plumage and also supports the durability of the feathers without damaging the natural layer of fat on the feathers. Spray Jungle Shower over the bird. Once the day before benching. Once on the day the bird returns home from a show. During the interim periods: every 2 to 3 days. Copyright © 2015 - 2016 Animall Mega Store. All rights reserved.